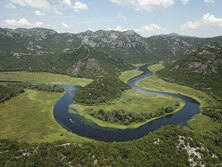 Destination: Lake Skadar National Park, Lovćen National Park, the Bay of Kotor, Cetinje. Just behind the coast, the interior of the country around the old royal city of Cetinje is the heart of the historical principality of Montenegro. It includes not only Lovćen National Park with its rugged karst formations, but also the fertile wine region on the shores of the largest lake of the Balkan peninsula, Lake Skadar.